So when we start talking about shoes, we need to figure out the surface area of the footwear. Luckily, Caitlin had flat-soled shoes on and volunteered to provide data for our calculation. 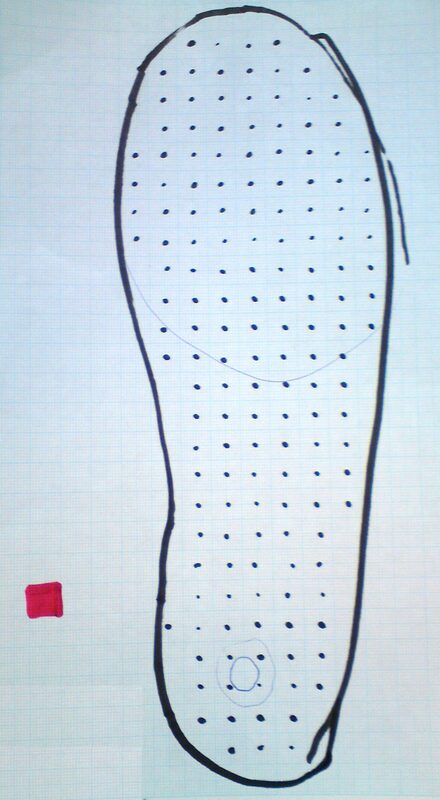 Here is the outline of her shoe, it’s drawn on graph paper so that the area can be calculated quickly by counting the large squares. Each large square is 1 square centimetre – we counted the approximate area by considering only whole squares inside the black outline of the shoe. The Science Babe has made a video on this topic. Good physics in here, although I’m not sure she can claim the equation shown above is Newton’s 2nd law. What do you think? is the World Cup hollow?